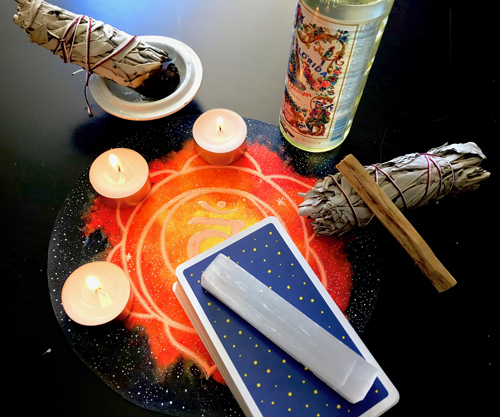 Before you start reading for yourself or others, it’s important to cleanse your tarot deck of any old or stagnant energies that might be attached to it. Do this when you buy a new deck, then every time you feel your cards seem heavy with energy that doesn’t serve your readings anymore. Personally, when I get a new deck, I might use more than one tool to cleanse it, then spend some time with it before starting to use it for readings. One way to get to know a deck better is to do a tarot deck interview. More on that in a future article. I also like to cleanse my deck before each reading, but in this case, I won’t spend more than half a minute on it. I prefer this method because it makes my cards always seem light, fresh, and ready to work with me. If I haven’t cleansed my deck in a long while (because I haven’t used it), then I will spend more time on this step. Palo santo – I fell in love with palo santo since I started going to my shaman. She always burns palo santo during sessions, so I associate the scent with the safe space that she creates for me, and the lightness that I feel when I leave her office. Palo santo is always my first choice when it comes to cleansing my tarot deck, myself, or my house. Just light it up, let it burn for a few seconds, then blow out the flame and pass your deck through the smoke while you hold the intention of clearing any bad vibes, so it can give you straight answers in your readings. Florida water – Yes, my shaman is responsible for my love of Florida water, too! I might spray it in the air and pass the deck through the light spray a couple of times, or I might put some water on my hands, rub them, then hold my deck and visualize white light pouring over it and washing the old energies down into the ground. White sage – I use it the same as palo santo, and I make sure to open a window, as it produces a tad more smoke. Also, never when my partner is about to get home from work, because he’s like “oh, it smells like food”, when there’s actually no food, just white sage smoke. White light – I mentioned it above because I like to combine this one with Florida water. What I do is: hold the deck between my palms, close my eyes, take three deep breaths to relax, then start visualizing a wave of white light pouring down from the sky and over my hands and deck. I imagine the stagnant energies are these thin, gray and rippling lines that get washed down by the white light and directed into the earth to be transformed and re-used. Reiki – I hold the deck between my palms and give Reiki to it for a minute or two. This one is very simple, as Reiki purifies anything you offer it to. Selenite – Once I’m done with my tarot readings for the day, I place a selenite wand on my deck and just leave it there. Selenite is known for its clearing and purifying properties. Basically, you can use it any way you like. I feel like the next day, my deck is like new. Regardless of the method you choose, the most important here is your intention. The cleansing ritual doesn’t have to be fancy or last for more than a few seconds, as long as your intention to shoo the bad vibes is strong, and your belief that it is happening as you wish it comes from deep within you. Don’t think it. Feel it.